An essential part of anyone’s spiritual journey is time spent in the wilderness. In deed, it may be that “wilderness” describes the whole of the monastic life, for silence and self-emptying are two hallmarks of it. But time in the wilderness, or the mystic desert, need not be only sacrificial or brutal. There are delights in the wilderness. Recently, I asked a young man if he had ever spent time in the wilderness – either in nature, or interiorly. 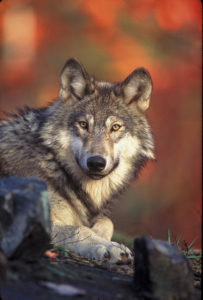 He told me the story of when he visited a different type of wilderness – a wolf sanctuary. He got up close and personal with an alpha female named “Grey Cloud.” Her name comes from her coat – grey, fluffy, ethereal. I asked him about Grey Cloud’s eyes. He answered: “Intense, deep, knowing.” When Grey Cloud first saw this young man, she locked eyes with him, sauntered over to him, and nuzzled his chin. He said this encounter was the most connected he has ever felt with something wild, and with the wild within himself – an essence of something original, authentic, and fully alive. I believe that what this young man described is similar to what we find in any wilderness experience – whether it is in a particular life season, in nature, or in the practice of meditation. We connect with the “wild” inside – the radical, untamed, indwelling Presence of God. We encounter the intense, deep knowing of Oneness. We experience a silent, transcendent exchange, in which we are simultaneously emptied of self, and filled with Self. This is the delight we find in the wilderness. Photo by Gary Krame, USFWS, made available through Flickr and Creative Commons. This entry was posted in Reflections on February 28, 2018 by meditat5-ca.